I was right. All you angels are assholes. 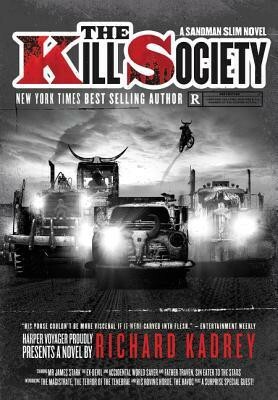 “The Kill Society” is the ninth book in “Sandman Slim” series, by Richard Kadrey. It continues the story of our favorite eponymous character — Sandman Slim — who was killed killed in his last outing . He wakes up in the Tenebrae, the desolate land of the dead. The Sandman Slim books have always been fast paced, quick-witted action thrillers. While they might be short on character development, they are brilliant in their world building, plotting and pacing. ‘The Kill Society’ is no exception. This time around, it is a mix of Mad Max meets Alistair Maclean meets Sandman Slim. There are no spoilers here since the Mad Max part is quite evident in the cover. There were elements of paranoia and subterfuge in the book which reminded me of MacLean’s Golden Rendezvous and The Satan Bug. This book is fast and I was constantly turning the pages to find out what happened next. The book puts Sandman Slim in a situation bereft of his usual advantages and this is an interesting take at this point in the series. The only element of this book that I did not like was its ending which was predictable. Sandman Slim fans will love this book. There is a lot of violence. Sarcasm abounds. You have a great villain. Some old and familiar characters return and play an important part in the story. Samael is present. This might also be a critique of the current times we live in — given how easily people are misled on crusades. Readers unfamiliar with this character are likely to enjoy this but will miss out on the back story and references. This is a fantastic read — I recommend it to all readers of fantasy.